Day 2 of #PCA2016 saw 195 players make it through the night w/ Brazil's Leonardo Pires leading. Thanks to the 25 players that took advantage of the late registration period, the 2016 PokerStars Caribbean Adventure $5,300 Main Event officially attracted 928 entries, which created a $4,500,800 prize pool that will be distributed to the top 135 players. Whoever finishes as the last player standing will walk away with a cool $833,260, along with the title and coveted trophy. The man best positioned to make a run at the title is Brazil's Leonardo Pires, who finished the Day 2 as chip leader with 524,000. Others who bagged big among the 195 survivors were Franco Spitale (432,300), Sampson Simmons (421,400), Phillip McAllister (420,600), Ami Barer (353,000), and Steve O'Dwyer (430,900), who was less than 24 hours removed from winning the $50,000 Single-Day High Roller. Day 2 saw nearly 600 players return to action, but over the course of five 90-minute levels hundreds would hit the rail including actress Sasha Barrese, Mustapha Kanit, Bryn Kenney, Dan Colman, Isaac Haxton, Ole Schemion, Ryan Riess, Chris Moorman, Joe McKeehen, and Team PokerStars' Andre Akkari, Daniel Negreanu, Fatima Moreira de Melo, Jaime Staples, and Chris Moneymaker. Regarding Moneymaker, the 2003 World Series of Poker champ fell in Level 10 (500/1,000/100) when Thomas Muehloecker put Moneymaker all in on the board. Moneymaker called with the , but it was no good against the that Muehloecker held for two pair and Moneymaker was eliminated. 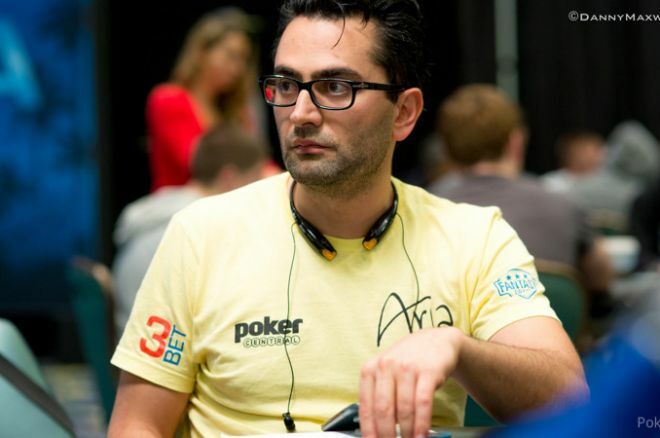 Another player to exit, albeit it in an unprecedented manner, was Antonio Esfandiari. He was disqualified due to a "breach of etiquette" at the table. Late on Day 2, Esfandiari admitted to urinating in an undercover container while in the tournament, a decision tied to a prop bet with Bill Perkins that required him to lunge everywhere he went for 48 hours. He said that all of the lunging made it extremely painful to move, but believed he took things too far and that it was a lack of judgement on his behalf. At the time of the disqualification, Esfandiari had about 100,000 in chips. Among those who survived the night were Jonathan Jaffe (255,400), John Racener (192,200), Kevin MacPhee (182,400), Toby Lewis (160,400), Calvin Anderson (153,900), Fedor Holz (114,500), and Benjamin Pollak (65,900).